When it comes to cooking, there is nothing better than a dish that simmers away on the stove top for hours. Not only is the smell intoxicating, it provides a nice continuous gentle heat in the house, and lifting the lid on a gently simmering pot of delicious ingredients is the best! That only gets better when you can basically throw a bunch stuff in a pot, walk away for a while, and let it simmer away until it turns to something flavorful, satisfying, and just plain tasty. I started thinking about this since I am helping with a family member who is very ill and trying to make sure that I can provide the one thing I know, food. But, I wanted to be able to create a few recipes rather quickly with little fuss. I could think of nothing better than homemade chili. Let’s talk chili, I think there is a stigma about chili that hangs around. It is either too spicy, salty, too meat-centric or it just takes too long to long to make. Sounds like a familiar story, right? I am here to tell you that you can have chili ready to eat in about ninety minutes and you can have it your way. Yes, your way. 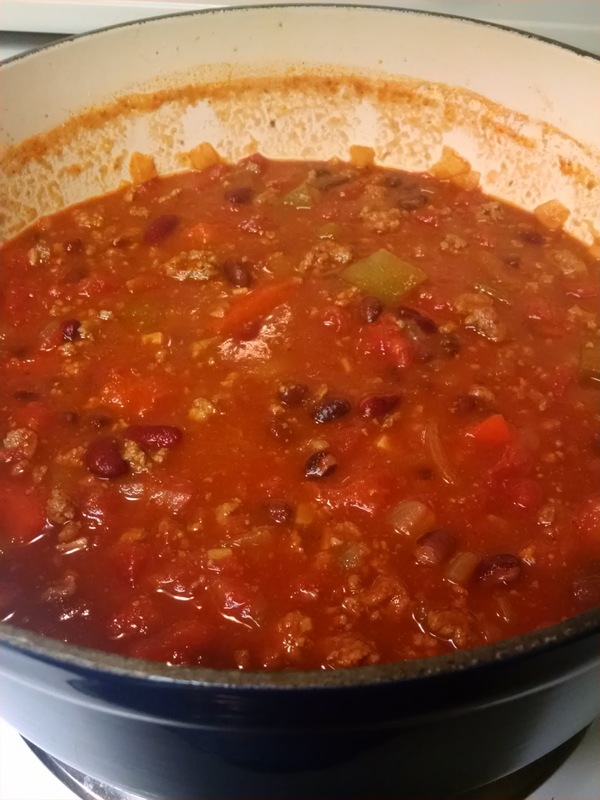 I will tell you that I’ve never made my own chili until the other day, and it couldn’t have been easier! For those of you who don’t like my billion photos, you are in luck, because I made this recipe under a deadline and I only took two photos. As luck would have it, only one photo really turned out the way I wanted. Rest assured, I won’t let my photo taking lapse because I would hate to deprive you of that. Click here for the original chili recipe, which is a recipe I adapted from allrecipes.com. Below is my version. In a large saucepan or dutch oven over medium high heat, saute ground beef until browned, about 5-7 minutes. Season both ground beef and pepper and onion mixture with a little salt and pepper. Remove ground beef with slotted spoon, drain most of the fat, leaving a little to saute peppers and onions until softened about 5-7 more minutes. Add the remaining ingredients, reserving the beans until near the end of the cooking time. Bring to a boil and reduce heat to low. Cover and simmer for 1 1/2 hours, stirring occasionally. With about 15 minutes remaining, stir in beans till they are warmed through and serve. I doubled up on the canned beans to give the chili some extra substance and body. This is great way to make it if you want to go the vegetarian route. *Scaling back on the dried spice is okay. I only used about a 1/4 teaspoon of chili powder and about an 1/8-1/4 teaspoon of cumin. Both of these go a long way and tend to really perfume and flavor the dish. When you “bloom” or cook dried spices in some oil over heat, those spices release a lot of their oil and can intensify in flavor. Make sure to give the spices time to develop so you can accurately adjust your seasoning level if needed. Remember, it is easier to add than have to try to take some of that spice out. Also, I omitted all the jalapeno as well. *Just a quick follow up related to the spice/heat level of the chili. I was making it for someone who can’t really tolerate much spice, but I wanted to give the chili a little undertone of heat. If you want to add more chili powder, jalapeno or something more intense like a fresno chili, then go for it! Remember, it is about knowing your audience and what they can tolerate. We want our family and friends to enjoy what we are cooking, but not make them feel like you are serving a bowl of Mount Vesuvius. Again, unless that is your goal, then let it rip! Paprika makes the world go round. Seriously, it has such a great flavor profile and provides a subtle depth. I added a couple of teaspoons to the chili when I made it. Oh, it also adds an incredible color and that makes it really look like you fussed over it for hours even though you didn’t. I will call this a cooking hack to save you some time. After some stirring, perhaps a beverage or two, and some patience you are rewarded with this. Serve this in a bowl with some cheese, sour cream, and a little cilantro on top. If you want to step this up, spoon some of this over some chips and top with cheese for some chili cheese nachos. Oh, still not enough hacks? Okay, how about some scrambled eggs topped with a little homemade chili to get your day started? Do it! You won’t be disappointed. Want to make a vegetarian version? As I said, no problem! Take out the ground beef, add a little vegetable stock, add some fresh yellow corn, and toss in some sauteed mushrooms near the end until they are warmed through and have absorbed some of that amazing chili base. pre-portioned containers into the freezer for a quick lunch or dinner anytime you. Once again, the twists on this are unlimited If you really want to wake this up, add some beer or coffee to really help reinforce some of those great flavors. The limits are your own, so be creative! I promise, nothing will be beat a bowl of this on a cold blustery days around the table with your loved ones.